Burt Freeman Bacharach (/ˈbækəræk/ BAK-ə-rak; born May 12, 1928) is an American composer, songwriter, record producer, pianist, and singer who has composed hundreds of pop songs from the late 1950s through the 1980s, many in collaboration with lyricist Hal David. A six-time Grammy Award winner and three-time Academy Award winner, Bacharach's songs have been recorded by more than 1,000 different artists. As of 2014[update], he had written 73 US and 52 UK Top 40 hits. He is considered one of the most important composers of 20th-century popular music. His music is characterized by unusual chord progressions, influenced by his background in jazz harmony, and uncommon selections of instruments for small orchestras. Most of Bacharach & David's hits were written specifically for and performed by Dionne Warwick, but earlier associations (from 1957 to 1963) saw the composing duo work with Marty Robbins, Perry Como, Gene McDaniels, and Jerry Butler. Following the initial success of these collaborations, Bacharach went on to write hits for Gene Pitney, Cilla Black, Dusty Springfield, Jackie DeShannon, Bobbie Gentry, Tom Jones, Herb Alpert, B. J. Thomas, the Carpenters, among numerous other artists. He arranged, conducted, and produced much of his recorded output. Songs that he co-wrote which have topped the Billboard Hot 100 include "This Guy's in Love with You" (1968), "Raindrops Keep Fallin' on My Head" (1969), "(They Long to Be) Close to You" (1970), "Arthur's Theme (Best That You Can Do)" (1981), and "That's What Friends Are For" (1986). A significant figure in easy listening, Bacharach is described by writer William Farina as "a composer whose venerable name can be linked with just about every other prominent musical artist of his era." In later years, his songs were newly appropriated for the soundtracks of major feature films, by which time "tributes, compilations, and revivals were to be found everywhere". He has been noted for his influence on later musical movements such as chamber pop and Shibuya-kei. In 2015, Rolling Stone ranked Bacharach and David at number 32 for their list of the 100 Greatest Songwriters of All Time. In 2012, the duo received the Library of Congress Gershwin Prize for Popular Song, the first time the honor has been given to a songwriting team. Bacharach was born in Kansas City, Missouri, and grew up in the Kew Gardens,  section of New York City, graduating from Forest Hills High School in 1946. He is the son of Irma M. (née Freeman) and Mark Bertram "Bert" Bacharach, a well-known syndicated newspaper columnist. His mother was an amateur painter and songwriter who was responsible for making Bacharach learn piano during his childhood. His family was Jewish, but he says that they didn't practice or give much attention to their religion. "But the kids I knew were Catholic," he adds. "I was Jewish but I didn't want anybody to know about it." Bacharach showed a keen interest in jazz as a teenager, disliking his classical piano lessons, and often used a fake ID to gain admission into 52nd Street nightclubs. He got to hear bebop musicians such as Dizzy Gillespie and Count Basie, whose style would later influence his songwriting. Bacharach studied music (Bachelor of Music, 1948) at Montreal's McGill University, under Helmut Blume, at the Mannes School of Music, and at the Music Academy of the West in Montecito, California. During this period he studied a range of music, including jazz harmony, which has since been important to songs which are generally considered pop music. His composition teachers included Darius Milhaud, Henry Cowell, and Bohuslav Martinů. Bacharach cites Milhaud as his biggest influence, under whose guidance he wrote a "Sonatina for Violin, Oboe and Piano." Following his tour of duty in the United States Army,[when?] Bacharach spent the next three years as a pianist and conductor for popular singer Vic Damone. Damone recalls: "Burt was clearly bound to go out on his own. He was an exceptionally talented, classically trained pianist, with very clear ideas on the musicality of songs, how they should be played, and what they should sound like. I appreciated his musical gifts." He later worked in similar capacity for various other singers, including Polly Bergen, Steve Lawrence, the Ames Brothers and Paula Stewart (who became his first wife). When he was unable to find better jobs, Bacharach worked at resorts in the Catskill Mountains of New York, where he accompanied singers such as Joel Grey. In 1956, at the age of 28, Bacharach's productivity increased when composer Peter Matz recommended him to Marlene Dietrich, who needed an arranger and conductor for her nightclub shows. He then became part-time music director for Dietrich, the German actress and singer who had been an international screen star in the 1930s. They toured worldwide off and on until the early 1960s; when they weren't touring, he wrote songs. As a result of his collaboration with Dietrich, he gained his first major recognition as a conductor and arranger. In her autobiography, she remembered that Bacharach loved touring in Russia and Poland because the violinists were "extraordinary," and musicians were greatly appreciated by the public. He liked Edinburgh and Paris, along with the Scandinavian countries, and "he also felt at home in Israel," she says, where music was similarly "much revered." Their working relationship ceased by the early 1960s, after about five years with Dietrich, with Bacharach telling her that he wanted to devote his full-time to songwriting. She thought of her time with him as "seventh heaven ... As a man, he embodied everything a woman could wish for. ... How many such men are there? For me he was the only one." In 1957, Bacharach and lyricist Hal David met while at the Brill Building in New York City, and began their writing partnership. They received a career breakthrough when their song "The Story of My Life" was recorded by Marty Robbins, becoming a number 1 hit on the U.S. in 1957. Soon afterwards, "Magic Moments" was recorded by Perry Como for RCA Records, and reached number 4 U.S. These two songs were back-to-back No. 1 singles in the UK, giving Bacharach and David the honor of being the first songwriters to have written consecutive No. 1 UK singles. Bacharach and David formed a writing partnership in 1963. Bacharach's career received a boost when singer Jerry Butler asked to record "Make it Easy on Yourself," and wanted him to direct the recording sessions. It became the first time he managed the entire recording process for one of his own songs. In the early and mid-1960s, Bacharach wrote well over a hundred songs with David. In 1961 Bacharach discovered singer Dionne Warwick while she was a session accompanist. After agreeing to work with him, Dionne made her professional recording debut and later that year had her first hit, "Don't Make Me Over". Bacharach and David then wrote more songs to make use of Warwick's singing talents, which led to one of the most successful teams in popular music history. Over the next 20 years, Warwick's recordings of his songs sold over 12 million copies,:23 with 38 singles making the charts and 22 in the Top 40. Among the hits were "Walk on By", "Anyone Who Had a Heart", "Alfie", "I Say a Little Prayer", "I'll Never Fall in Love Again", and "Do You Know the Way to San Jose?" She would eventually have more hits during her career than any other female vocalist except Aretha Franklin. Bacharach released his first solo album in 1965 on the Kapp Records label. "Hit Maker! Burt Bacharach Plays His Hits" was largely ignored in the US but rose to #3 on the UK album charts, where his version of "Trains and Boats and Planes" had become a top 5 single. In 1967, Bacharach signed as an artist with A&M Records, recording a mix of new material and re-arrangements of his best-known songs. He recorded for A&M until 1978. 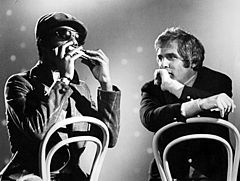 Although Bacharach's compositions are typically more complex than the average pop song, he has expressed surprise in the fact that many jazz musicians have sought inspiration from his works, saying "I've sometimes felt that my songs are restrictive for a jazz artist. I was excited when [Stan] Getz did a whole album of my music" (What The World Needs Now: Stan Getz Plays The Burt Bacharach Songbook, Verve, 1968). His songs were adapted by a few jazz artists of the time, such as Stan Getz, Cal Tjader, Grant Green, and Wes Montgomery. The Bacharach/David composition "My Little Red Book", originally recorded by Manfred Mann for the film What's New Pussycat?, has become a rock standard. Bacharach composed and arranged the soundtrack of the 1967 film Casino Royale, which included "The Look of Love", performed by Dusty Springfield, and the title song, an instrumental Top 40 single for Herb Alpert and the Tijuana Brass. The resulting soundtrack album is widely considered to be one of the finest engineered vinyl recordings of all time, and is much sought after by audiophile collectors. The year 1969 marked, perhaps, the most successful Bacharach-David collaboration, the Oscar-winning "Raindrops Keep Falling on My Head", written for and prominently featured in the acclaimed film Butch Cassidy and the Sundance Kid. The two were awarded a Grammy for Best Cast album of the year for "Promises, Promises" and the score was also nominated for a Tony award. Other Oscar nominations for Best Song in the latter half of the 1960s were for "The Look Of Love", "What's New Pussycat" and "Alfie". He swings. He jumps. He socks imaginary tennis balls from his conductor's podium. He's a hurricane that knows where it's heading. In 1971, Barbra Streisand appeared on "The Burt Bacharach Special," (aka "Singer Presents Burt Bacharach") where they discussed their careers and favorite songs and performed songs together. The other guests on the television special were dancer Rudolph Nureyev and singer Tom Jones. In 1973, Bacharach and David wrote the score for Lost Horizon, a musical version of the 1937 film. The remake was a critical and commercial disaster and a flurry of lawsuits resulted between the composer and the lyricist, as well as from Warwick. She reportedly felt abandoned when Bacharach and David refused to work together further. Bacharach tried several solo projects, including the 1977 album Futures, but the projects failed to yield hits. He and David reunited briefly in 1975 to write and produce other records. We realized we were more than just friends. We were family. Time has a way of giving people the opportunity to grow and understand ... Working with Burt is not a bit different from how it used to be. He expects me to deliver and I can. He knows what I'm going to do before I do it, and the same with me. That's how intertwined we've been. Other artists continued to revive Bacharach's earlier hits in the 1980s and 1990s. Examples included Luther Vandross' recording of "A House is Not a Home"; Naked Eyes' 1983 pop hit version of "(There's) Always Something There to Remind Me", and Ronnie Milsap's 1982 country version of "Any Day Now". Bacharach continued a concert career, appearing at auditoriums throughout the world, often with large orchestras. He occasionally joined Warwick for sold-out concerts in Las Vegas, Los Angeles, and New York, where they performed at the Rainbow Room in 1996. In 1998, Bacharach co-wrote and recorded a Grammy-winning album with Elvis Costello, Painted from Memory, on which the compositions began to take on the sound of his earlier work. The duo later reunited for Costello's 2018 album, Look Now, working on several tracks together. In 2003, he teamed with singer Ronald Isley to release the album Here I Am, which revisited a number of his 1960s compositions in Isley's signature R&B style. Bacharach's 2005 solo album At This Time was a departure from past works in that Bacharach penned his own lyrics, some of which dealt with political themes. Guest stars on the album included Elvis Costello, Rufus Wainwright, and hip-hop producer Dr. Dre. In 2008, Bacharach opened the BBC Electric Proms at The Roundhouse in London, performing with the BBC Concert Orchestra accompanied by guest vocalists Adele, Beth Rowley and Jamie Cullum. The concert was a retrospective look back at his six-decade career. In early 2009, Bacharach worked with Italian soul singer Karima Ammar and produced her debut single Come In Ogni Ora, which became a #4 hit. In June, 2015, Bacharach performed in the UK at the Glastonbury Festival, and a few weeks later appeared on stage at the Menier Chocolate Factory to launch 'What's It All About? Bacharach Reimagined', a 90-minute live arrangement of his hits. In 2016, Bacharach, at 88 years old, composed and arranged his first original score in 16 years for the film A Boy Called Po (along with composer Joseph Bauer). The score was released on September 1, 2017. The entire 30-minute score was recorded in just two days at Capitol Studios. The theme song Dancing With Your Shadow, was composed by Bacharach, with lyrics by Billy Mann, and performed by Sheryl Crow. After seeing the film, a true story about a child with Autism, Bacharach decided he wanted to write a score for it, as well as a theme song, in tribute to his daughter Nikki — who had gone undiagnosed with Asperger syndrome, and who committed suicide at the age of 40. Bacharach asked Director John Asher to see the film and offered to score it. "It touched me very much," the composer says. "I had gone through this with Nikki. Sometimes you do things that make you feel. It's not about money or rewards." Though not known for political songs, Live To See Another Day was released in 2018. "Dedicated to survivors of school gun violence" proceeds for the release went to charity Sandy Hook Promise, a non-profit organization founded and led by several family members whose loved ones were killed at Sandy Hook Elementary School in 2012. A co-write with Rudy Pérez it also featured the Miami Symphony Orchestra. Throughout the 1960s and 1970s, Bacharach was featured in a dozen television musical and variety specials videotaped in the UK for ITC; several were nominated for Emmy Awards for direction (by Dwight Hemion). The guests included artists such as Joel Grey, Dusty Springfield, Dionne Warwick, and Barbra Streisand. Bacharach and David did the score for an original musical for ABC-TV titled On the Flip Side, broadcast on ABC Stage 67, starring Ricky Nelson as a faded pop star trying for a comeback. While the ratings were dismal, the soundtrack showcased Bacharach's abilities to try different kinds of musical styles, ranging from (almost) 1960s rock, to pop, ballads, and Latin-tinged dance numbers. In 1969, Harry Betts arranged Bacharach's instrumental composition "Nikki" (named for Bacharach's daughter) into a new theme for the ABC Movie of the Week, a television series that ran on the U.S. network until 1976. During the 1970s, Bacharach and then-wife Angie Dickinson appeared in several television commercials for Martini & Rossi beverages, and even penned a short jingle ("Say Yes") for the spots. Bacharach also occasionally appeared on television/variety shows, such as The Merv Griffin Show, The Tonight Show Starring Johnny Carson, and many others. In the 1990s and 2000s, Bacharach had cameo roles in Hollywood movies, including all three Austin Powers movies, inspired by his score for the 1967 James Bond parody film Casino Royale. Bacharach appeared as a celebrity performer and guest vocal coach for contestants on the television show, "American Idol" during the 2006 season, during which an entire episode was dedicated to his music. In 2008, Bacharach featured in the BBC Electric Proms at The Roundhouse with the BBC Concert Orchestra. He performed similar shows in the same year at the Walt Disney Concert Hall and with the Sydney Symphony. The whole room would come to life with his conducting — the way he would look over at the drummer and with just a flick of his finger, things could happen. Once the groove was happening in the room, forget it; there was nothing like it. And everything, including the strings, responded to the kind of body movement that Burt had. He brings an incredible amount of life to the studio. He's probably one of the most amazing musicians in the world. I didn't want to make the songs the same way as they'd been done, so I'd split vocals and instrumentals and try to make it interesting ... For me, it's about the peaks and valleys of where a record can take you. You can tell a story and be able to be explosive one minute, then get quiet as kind of a satisfying resolution. While he didn't mind singing during live performances, he sought mostly to avoid it on records. When he did sing, he explains, "I [tried] to sing the songs not as a singer, but just interpreting it as a composer and interpreting a great lyric that Hal [David] wrote." When performing in front of live audiences, he would often conduct while playing piano., as he did during a televised performance on The Hollywood Palace, where he played piano and conducted at the same time. Bacharach has been married four times. His first marriage was to Paula Stewart and lasted five years (1953–1958). 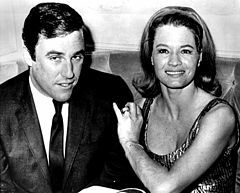 His second marriage was to actress Angie Dickinson, lasting for 15 years (1965–1980). Bacharach and Dickinson had a child, a daughter named Nikki Bacharach, who struggled with psychological problems. Nikki committed suicide in 2007 at the age of 40. 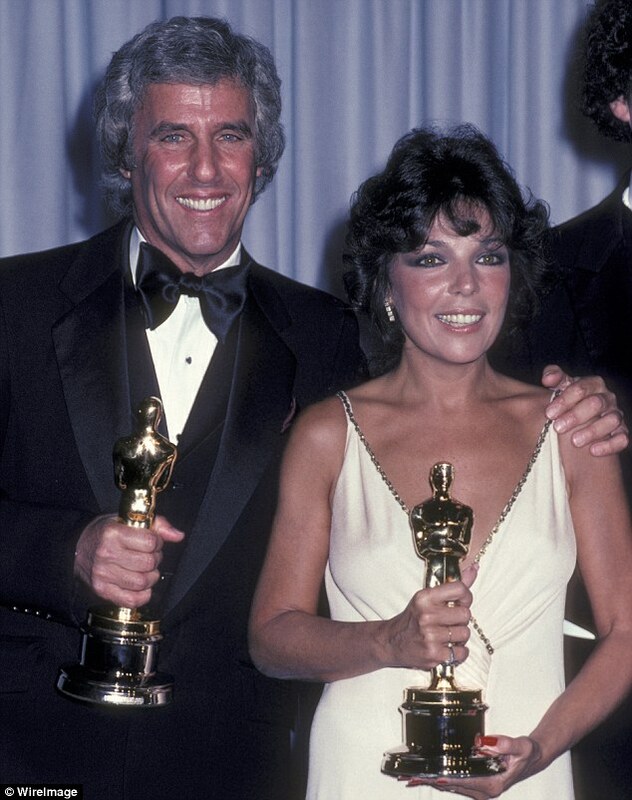 Bacharach's third marriage was to lyricist Carole Bayer Sager, which lasted nine years (1982–1991). Bacharach and Bayer Sager collaborated on a number of musical pieces and adopted a son named Christopher. Bacharach married his fourth wife, Jane Hansen, in 1993; they have two children, a son named Oliver, and a daughter named Raleigh. His autobiography, Anyone Who Had a Heart, was published in 2013. 1969, Academy Awards and a Grammy award, Butch Cassidy And The Sundance Kid (1969), "Raindrops Keep Fallin' On My Head". 1981, Academy Award and Golden Globe for Best Original Song, "Arthur's Theme (Best That You Can Do)"
1997, Trustees Award from NARAS on the Grammy Awards broadcast. 1997, subject of a PBS "Great Performances" biography, "Burt Bacharach: This is Now,". 1998, Grammy Award for the single "I Still Have That Other Girl," in collaboration with Elvis Costello. 2000, People magazine named him one of the "Sexiest Men Alive", and one of the "50 Most Beautiful People" in 1999. 2001, Polar Music Prize, presented in Stockholm by His Majesty King Carl XVI Gustaf of Sweden. 2002, National Academy Of Recording Arts and Sciences (NARAS) New York Heroes Award. 2005, GQ Magazine Inspiration Award. The success of their creative genius continues today as they each add new songs to what is without question one of the richest and most recognizable multi-generational playlists known to the world. Their creative talents have inspired songwriters for more than five decades, and their legacy is much in the tradition of George and Ira Gershwin, for whom this award is named. 2006, George and Ira Gershwin Award for Musical Achievement from UCLA. 2006, Thornton Legacy Award, USC; They also created the Burt Bacharach Music Scholarship at the Thornton School to support outstanding young musicians. 2008, Lifetime Achievement Award, when he was proclaimed music's "Greatest Living Composer." 2009, Bacharach received an honorary Doctorate of Music from Berklee College of Music. The award was presented to him during the Great American Songbook concert, which paid tribute to his music. 2011, Gershwin Prize for Popular Song, with Hal David, awarded by the Library of Congress. When Ronan Met Burt (2011) An album of Bacharach songs, arranged and co-produced by Bacharach. Stan Getz released the album What the World Needs Now: Stan Getz Plays Burt Bacharach and Hal David in 1968. Jazz musician John Zorn produced a 2-CD set of Bacharach tunes (1997), featuring several avant-garde musicians, as part of his Great Jewish Music series. Marie McAuliffe's Ark Sextet released the Bacharach tribute album "Refractions" in 1998. McAuliffe had been featured on John Zorn's tribute album. To Hal and Bacharach is a 1998 tribute album with 18 tunes, performed by notable Australian artists. All Kinds of People: Love Burt Bacharach (2010) is a tribute album produced by Jim O'Rourke, featuring covers from Haruomi Hosono and Thurston Moore among others. The Concord Blue Devils Drum and Bugle Corps' 2011 show The Beat My Heart Skipped was a tribute to the music of Burt Bacharach. This Girl's In Love (A Bacharach & David Songbook), released in November 2016 by Anglo-Pakistani singer-songwriter Rumer (real name Sarah Joyce). ^ "Reviews". Spin. October 2006. ISSN 0886-3032. ^ a b Jackson 2015, p. 176. ^ a b Anon. (n.d.). "Shibuya-Kei". AllMusic. ^ a b c "Burt Bacharach interview: what was it all about? ", The Telegraph U.K., June 1, 2013. ^ "Burt Bacharach: A House Is Not A Homepage". Bacharachonline.com. Retrieved May 19, 2011. ^ John, Bush. "Burt Bacharach". AllMusic. ^ Farina 2013, p. 144. ^ Lindsay, Cam (August 4, 2016). "Return to the Planet of Cornelius". Vice. ^ "100 Greatest Songwriters of All Time". Rolling Stone. August 2015. ^ a b "Hal David, Burt Bacharach honored in D.C. with Gershwin Prize". Los Angeles Times. May 9, 2012. ^ Cossar, Neil. "This Day in Music, May 12: Burt Bacharach, Neil Young; Burt Bacharach celebrates his 83rd birthday, Neil Young gets an eight-legged claim to fame. ", The Morton Report, May 11, 2011. Accessed November 28, 2017. "The son of nationally syndicated columnist Bert Bacharach, Burt moved with his family in 1932 to Kew Gardens in Queens, New York. At his mother's insistence, he studied cello, drums, and then piano beginning at the age of 12." ^ "Burt Bacharach". Masterworks Broadway. Retrieved 24 February 2019. ^ a b "Burt Bacharach Biography (1928?-)". Filmreference.com. Retrieved May 19, 2011. ^ Pennsylvania Biographical Dictionary - Google Books. Books.google.ca. Retrieved February 20, 2013. ^ Bacharach, Burt. Anyone Who Had a Heart: My Life and Music, HarperCollins (2013), ebook Chapter 1, "The Story of My Life". ^ a b c "Burt Bacharach: Blue Bacharach". Jazz Times. December 2004. Retrieved July 16, 2013. ^ a b Written, Narrated and Produced by John Gilliland; Chester Coleman, Associate Producer (February 1969). "Show 24: The Music Men-Part 2". John Gilliland's The Pop Chronicles. Pasadena, CA: UNT Digital Library. KRLA. Retrieved May 19, 2011. ^ Damone, Vic. Singing Was the Easy Part, Macmillan (2009) ebook. ^ "Burt Bacharach: A Composer Steps Onstage with Shower of Swinging, Successful Melodies", Chicago Tribune, June 14, 1970. ^ "Bachrach recalls Dietrich," Independent Press-Telegram (Long Beach, CA), March 14, 1971, p. 90. ^ Mossman, Kate (July 18, 2013), "Burt Bacharach is a direct line to a lost musical world", New Statesman. ^ a b Barber, Richard (June 10, 2016), "Burt Bacharach at 88: 'Why would I ever want to stop? '", The Telegraph U.K.
^ "Press Raps With Marlene While She Raps the Press,", The Star Press (Muncie, IN), January 12, 1973, p. 22. ^ a b Brill Videos (May 1, 2014). "Burt Bacharach Documentary". Retrieved February 11, 2018 – via YouTube. ^ a b Dietrich, Marlend. Marlene, Grove Press (1989) ebook. ^ "Burt Bacharach remembers Hal David". Los Angeles Times. September 3, 2012. ^ Dave Simpson. "Burt Bacharach: Marlene Dietrich's music sucked! But I liked her | Music". The Guardian. Retrieved November 9, 2015. ^ a b "Dionne Warwick: dizzying downfall of a bankrupt diva", The Telegraph U.K., March 30, 2013. ^ a b c Lohof, Bruce. American Commonplace: Essays on the Popular Culture of the United States, Popular Press (1982). ^ Robin Platts (2003). Burt Bacharach & Hal David: What the World Needs Now. Collector's Guide Publishing. ISBN 978-1-896522-77-7. ^ Burlinghame, Jon (2012), The Music of James Bond, OUP, p. 68. ^ Reed, Rex. "Special TV Specials: An Evening with Doris Day and Burt Bacharach," Chicago Tribune, March 14, 1971. ^ "Burt Bacharach, Barbra Streisand appear tonight, Green Bay Press-Gazette (Green Bay, Wisconsin), March 14, 1971. ^ "Singer Presents Burt Bacharach - with Barbra Streisand", 1971. YouTube video. ^ Photo of Bacharach and Sager after they won the Oscar in 1982 for best song, "Arthur's Theme" for the film Arthur. ^ "Photo of Neil Diamond with Sager and Bacharach in 1987". Retrieved February 11, 2018. ^ "Two for the Show: Their musical falling-out long behind them, Dionne Warwick and Burt Bacharach prove that staying apart is hard to do," The News Journal (Wilmington, Delaware), January 13, 1997. ^ turnupthemusic000 (November 3, 2014). "Dionne Warwick and Burt Bacharach: Live at The Rainbow Room (1996)". Retrieved February 11, 2018 – via YouTube. ^ "Elvis Costello Reunites With The Imposters & Burt Bacharach On New Album Look Now: Hear Two Songs". Stereogum. Retrieved 5 April 2019. ^ "Glastonbury 2015 - Burt Bacharach". BBC Music Events. Retrieved February 11, 2018. ^ Sarabande, Varèse. "A Boy Called Po (Digital Only) | Varèse Sarabande". Varèse Sarabande. Retrieved September 11, 2017. ^ a b Burlingame, Jon (January 5, 2017). "Burt Bacharach Writes From the Heart for 'Po' Score". Variety. Retrieved September 11, 2017. ^ Krakower Group (August 22, 2017). "Varèse Sarabande Records to Reissue A Boy Called Po – Original Motion Picture Soundtrack, in Conjunction with the Film's Theatrical Release". www.filmscoremonthly.com. ^ O'Malley, Sheila. "A Boy Called Po Movie Review & Film Summary (2017) | Roger Ebert". www.rogerebert.com. Retrieved September 11, 2017. ^ "Burt Bacharach's daughter commits suicide". The Washington Post. ISSN 0190-8286. Retrieved September 11, 2017. ^ Live To See Another Day - charity website benefiting Sandy Hook Promise Live To See Another Day; accessed 5 April 2019. ^ Aguila, Justino (2018-09-17). "Burt Bacharach and Rudy Perez pen Live to See Another Day for School Gun Violence Survivors". Billoard. Retrieved 2019-04-04. ^ Frans Jansen (November 2, 2008). "Dusty Springfield - A House Is Not A Home". Retrieved February 11, 2018 – via YouTube. ^ "BBC Electric Proms 2008". BBC. Retrieved May 19, 2011. ^ "Close To You: Burt Bacharach In Concert". npr.org. July 3, 2008. Retrieved May 19, 2011. ^ a b c d e The Mojo Collection: 4th Edition, Canongate Books (2003), p. 165. ^ Musiker, Naomi, and Musiker, Reuben. Conductors and Composers of Popular Orchestral Music, Routledge (1998), ebook. ^ Voger, Mark (February 28, 2015). "Burt Bacharach bound for Red Bank, Englewood". nj.com. ^ Schoeneweis, Barbara. "Bacharach Opens at Arts Center", Asbury Park Evening Press, June 29, 1971. ^ Burt Bacharach and Angie Dickinson co-hosting The Hollywood Palace in 1970. ^ Gavin Martin (October 17, 2008). "Burt Bacharach – Meet the maestro". Daily Mirror. UK. Retrieved May 19, 2011. ^ "Oldies but goodies: PBS documentary looks at Burt Bacharach and those melodies that still sound so good", Chicago Tribune, May 14, 1997. ^ a b c d e "Official Press Biography - A House Is Not A Homepage". bacharachonline.dreamhosters.com. Retrieved February 11, 2018. ^ "Burt Bacharach, Hal David Named Recipients of Fourth Library of Congress Gershwin Prize for Popular Song", Library of Congress, September 28, 2011. ^ Dreilinger, Danielle (April 10, 2009), "Burt Bacharach: Class Act", Berklee College of Music. ^ a b c d "Gold & Platinum - RIAA". RIAA. Retrieved August 22, 2018. ^ "Promises, Promises- Opening Night Production Credits". Internet Broadway Database. Retrieved May 18, 2011. ^ "Jim O'Rourke - All Kinds Of People: Love Burt Bacharach". Discogs. ^ "Back To Bacharach - The Very Best of Burt Bacharach concert tour". www.back-to-bacharach.co.uk. Retrieved January 26, 2019. Farina, William (2013). The German Cabaret Legacy in American Popular Music. McFarland. ISBN 978-0-7864-6863-8. Jackson, Andrew Grant (2015). 1965: The Most Revolutionary Year in Music. Thomas Dunne Books. ISBN 978-1-250-05962-8.